We've gotten swap-happy with yet another classic dessert! We kept the pineapple and those pretty cherries but went to work on the cake base and topping... Check it out! Preheat oven to 350 degrees. Spray a round cake pan with nonstick spray and set aside. Place butter in a small microwave-safe bowl and microwave for about 15 seconds, just until melted. Add brown sugar and mix well. Spread mixture evenly along the bottom of the cake pan. Set aside. Blot pineapple rings and cherries with paper towels to remove any excess moisture. 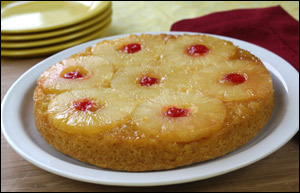 Lay pineapple rings in an even layer in the cake pan, and place one cherry in the center of each pineapple ring. Set aside. To make the batter, combine cake mix with baking powder in a large bowl. Mix well. Add club soda and applesauce, and stir until smooth. Evenly pour batter into the cake pan over the fruit layer. Bake in the oven until a toothpick inserted into the center comes out clean, 30 - 35 minutes. Allow cake to cool completely. Firmly and securely place a plate over the pan, and carefully flip so the plate is on the bottom. Gently lift pan to release the cake. Cut into 8 slices and dig in! Fruity desserts, you've fooled us before. 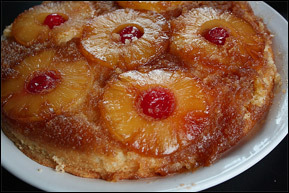 But don't think this is our first trip to the cake rodeo, Pineapple Upside-Down Cake. We can see right through your empty promises. The rings of pineapple on top studded with bright red cherries lure us in. You say, "I've got fruit on top, not frosting! I'm not that bad!" But with all that fruit comes a buttery, sugary, caramelized layer on top of a dense and too-sweet slab of cake. Now, we DO love the taste of cake, fruit, and buttery, sugary, caramelized layers... We just want to avoid consuming the way-too-many fat grams and calories that come along with them. And the safest way to do it is to make that cake ourselves. Our version is moist, beautiful, and delicious. It's even pretty and tasty enough to be taken to a neighborhood potluck. Tell everyone that it's low in calories and fat, and you'll be the talk of the block... Or just keep it a secret. Your call. Been neglecting your pals? Maybe it's a good day to click "Send to a Friend" to let them know you care. Cake is caring, people! It's officially the Ides of March! If your name is Julius Caesar -- we think we'd have noticed a subscriber with that name, but just in case -- be EXTRA careful today.